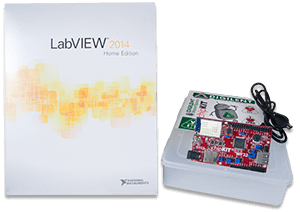 Click the button below to add the LabVIEW Physical Computing Kit with Digilent WF32 to your wish list. That's why we've created the Physical Computing Kit. This kit, combined with LabVIEW Home Bundle, gives you an inexpensive yet versatile way to connect to the outside world. We selected the WF32 because of its extensive onboard capabilities. It has a WiFi module that lets you communicate with a world of wireless devices, a Micro SD card slot for reading & storing large amounts of data, and a USB 2.0 controller for power, configuration, and your own USB applications. But that's just the beginning, because you'll also have access to the WF32's 43 available I/O pins. Connect whatever sensors, displays, controls, peripherals, etc. you like and LabVIEW Home will be able to use them. With LabVIEW Home, there's no need to wire up sensors, potentiometers, resistors, etc. on a breadboard. LabVIEW Home becomes the breadboard, allowing you to create a block diagram graphically. In other words, you don't need to learn physical circuits in order to create useful experiments & projects. 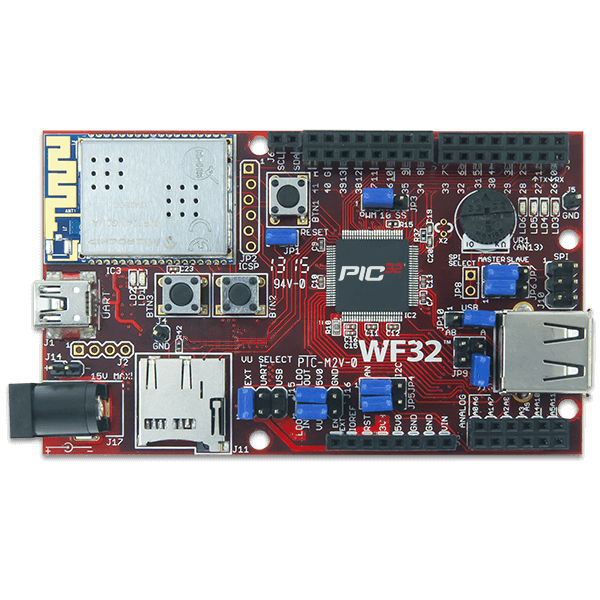 With just the chipKIT WF32, you'll have a WiFi module, a Micro SD card slot, USB 2.0, a potentiometer, and 4 LEDs all at your disposal. These tutorials can walk you through an introduction to the LabVIEW interface, programming examples, setting up your WF32 for connection, connecting to I/O, datalogging, and WiFi connectivity. The chipkit WF32 board worked perfectly after testing with LabVIEW LINX using Serial and TCP protocol. First time setup and testing WIFI a little bit rough with Win10 for IP at port 44300 now worked OK with Win7 and Win10. Not at all familiar with microprocessors or LABVIEW, but managed to interface the WF32 with LABVIEW (per instructions) and all the example problems worked fine. Purchased a PMODTMP3 and wired it to the WF32 as instructed and it all played together fine. I have been through some of the tutorials for LabVIEW and the ChipKit. The tutorials are put together and are very professional. I can't wait for the weekend to start exploring some more. The only problem that I had was that the newest version of LINX did not work with the ChipKit. I rolled back 2 or 3 versions and it works just fine. Sam Kristoff mentioned that they are working to roll out a new version with a fix to work with the chipKit. It should be out soon by what same wrote in the forum. But until it comes out you can just use the old version of LINX.